If we're going to spend $599 on a phone, it needs to offer unparalleled audio quality, absolutely seamless device integration, and a drop-dead gorgeous design. Invoxia, a new entrant to the world of VoIP telephony, claims to have created just that, with its NVX 610. The desktop unit uses an iPhone (or iPod touch or iPad) app as its control interface -- the hardware itself includes only touch-sensitive volume, mute, speakerphone, and voicemail keys. With the exception of accessing your iOS device's address book, however, all of the phone's hardware is self-contained. Calls are processed using the built-in ARM Cortex-A8 processor, and can be made via Skype or any third-party SIP. You can also take incoming iPhone calls using the handset or speakerphone, but all outgoing calls are processed using VoIP, not your iPhone's mobile network. We took a peek at the NVX 610 at IFA, and definitely liked what we saw. Jump past the break for our initial impressions, and a (somewhat noisy) intro video from Invoxia CEO Serge Renouard. From what we saw, the NVX 610 appeared to be conceptually sound, though because of connectivity issues we were only able to listen to a simulated demo mode. The device connects to your iPhone, iPod touch or iPad using the 30-pin dock connector, or over Bluetooth (a built-in connector and attachments can fit a variety of iPhones and iPod touches, and you can connect your iPad using an Apple-supplied dock connector cable). Renouard insisted that audio quality was identical when making actual phone calls, and if that's really the case, we could easily see this replacing both corporate desk phones, which can sometimes cost close to the 610's $600 retail price, and conference room speakerphones, which occasionally cost even more. And since the device can access your iPhone or iPad's address book, being able to use multiple phones in the office while maintaining access to all of your contacts could prove invaluable. One of the phone's most useful features is its position-based audio in speakerphone mode. If both callers are using the 610 and this mode is enabled, it uses eight microphones and eight speakers to differentiate between users based on where they're sitting in a room. Callers sitting to the left of their phone will be heard from the left speakers, for example -- particularly helpful when you're talking to multiple people speaking from the same conference room. There's also a similar mode for music playback (yes, you can play music from iOS as well). Pink Floyd's Money definitely offered fuller sound in this multi-position mode, though it's difficult to provide a more detailed analysis since our demo was in the construction zone that surrounded the Invoxia booth. It's easy to imagine the 610 providing better sound in a quiet office, and music playback obviously isn't a key feature of a VoIP phone. Overall, the Invoxia NVX 610 is an elegant desktop VoIP solution. All of the hardware is self-contained -- iOS is really only used to manage the address book, display visual voicemail, adjust settings, and dial phone numbers. It's more than just a speakerphone and handset dock -- all calls are processed within the desktop device itself. $599 is far more than you'll want to spend to install this at home (Renouard says a cheaper home unit is in the works), but for businesses used to spending at least this much for each enterprise user, we could see this being a hit. The phone is now available on Invoxia's website, with an "introductory" $499 price tag. The desktop phone meets Darwin. invoxia - telephony's year one. Today, 135 years after the telephone was invented, invoxia is finally revolutionizing the desktop phone. By selecting the iPhone to serve as its interface, invoxia has reconciled the world's smartest mobile solution and the requirements of sedentary business. Ease of use, revolutionary ergonomics, sleek design, amazing acoustics, dramatic sound spatialization and disruptive technologies are all hallmarks of this wholly new tool, marking the advent of sensory telephony. 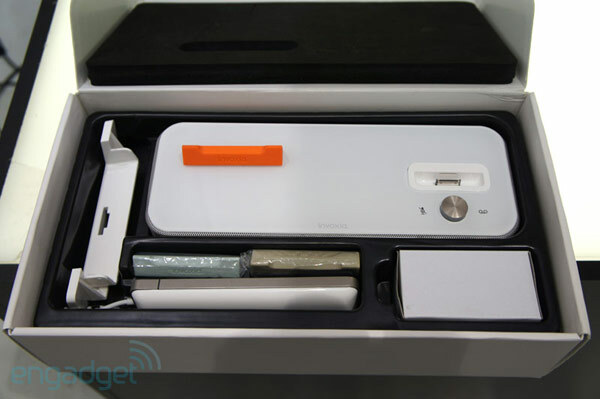 With this, invoxia is determined to set a new global benchmark for the office desktop phone. Invoxia has decided to turn the world of business telephony on its head and create an aesthetically pleasing, user-friendly object more consistent with the world we live in. Says Serge Renouard, Invoxia co-founder: "Eric Carreel and I made the observation that business telephony had never really moved forwards. Existing devices are highly complex and, surprisingly, unable to provide levels of service comparable to what consumer mobile handsets - such as the iPhone - can offer. With Invoxia, we are seeking to create a device featuring the best technology in order to achieve unparalleled efficiency and quality". The invoxia NVX 610 is the first desktop IP phone that uses the iPhone as its control interface to radically simplify business telephony. With its ultra-innovative acoustic design, it offers unparalleled sound quality in both handsfree mode and personal communications (using the handset). 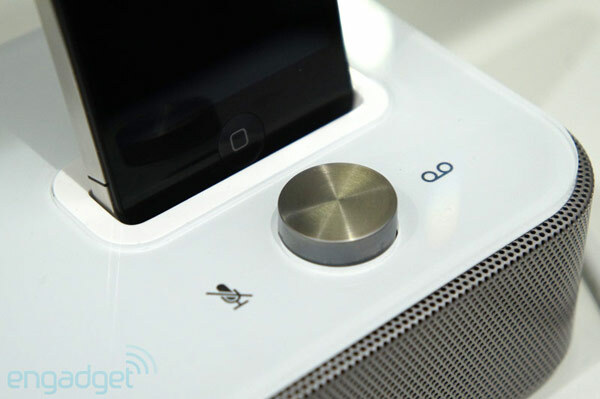 The invoxia phone features 8 wide-bandwidth speakers and 8 digital microphones. When used in "conference" mode, it will have the capacity to perform virtual placement of remote speakers in the room, as well as automatic local speaker localization to create the feel of a physical conversation. Users benefit from the full potential of In Vivo Acoustic technology, with its echo and background noise cancellation systems. While regular office phones come with hundreds of keys and features that no one understands, invoxia features only the essential: a control to pick up incoming calls in speaker mode and adjust the volume, and a mere two touch-sensitive "mute" and voicemail keys. With the iPhone as an interface and free application available from Apple's App Store, using the invoxia could hardly be more intuitive. The invoxia unifies your mobile and professional contacts in the same directory, and lets you pick up calls to your mobile directly from its high-quality handset. The phone seamlessly handles incoming calls on both the mobile and landline. Its exclusive design makes it uniquely well suited to modern office environments. For added fun, invoxia comes with a set of 3 smart holders (magnetic handset holders) that can be changed to suit your mood or style. The product is available from www.invoxia.com priced at 417.22 € excl. VAT ($599 excl. VAT). invoxia is made for iPod touch (3rd & 4th generation), iPhone 4, iPhone 3GS, iPad 2 and iPad. VoIP has so far been considered merely as a way to keep costs down, and it is true to say that it has now taken a foothold in almost every home and business. But more than this, VoIP also offers a chance to drastically improve the audio quality of phone conversations by leveraging the Internet's resources and IT devices' computing power. invoxia has explored these new capacities in a bid to turn business telephony on its head and introduce totally new levels of quality in phone sound and user experience. Apple's global success - notably that of the iPhone - is evidence of the triumph of the user. In massively adopting the iPhone, users have voted for a high-quality, ergonomic and intuitive device. This revolution has significantly reshuffled the cards, with leading Telco's dominant position now under threat. When Apple started to offer truly intuitive, powerful and user-friendly devices that won over the general public, a rift appeared with the business world, where users gradually gave up the professional devices supplied by their management and started using their own smartphones. Today, about half of all smartphones and 70% of iPads used for work are purchased by employees themselves. A Forrester survey released in July 2011 shows that within the next few years, touch-screen smartphones and tablets will be the norm in business environments, with 60 million tablets and 175 million smartphones used at work by 2015. In the US, as in Europe and Asia, the iPhone and iPad – although see as costly – are experiencing high growth in business environments. Today, even CIOs in large companies - not to mention small and micro-business – are letting employees get their hands on an iPhone: Disney, Deutsche Vermögensberatung, the Financial Times, Korean Telecom, M6, Novartis, Hyatt Hotels... The iPhone has even been selected as the sole smartphone across Total group, and is now enjoyed by 5 000 executives of the French oil major. Like some sort of fossil from the past, business telephony has experienced very little change over the decades in terms of design and features. Quite naturally, the gap in ergonomics and quality between our desktop and smartphones has become blatant. What do users make of the massive dinosaurs sitting on their desks, even more so as actually using them remains a mystery? (Office phones offer up to 300 features - but even an advanced user, at best, hardly knows how to forward a call...). That's why invoxia is setting out to put an end to this historical and technological aberration! High-definition sound technology delivers acoustic comfort yet unparalleled in a phone. The device reflects the subtle nuances of the speakers' voice. This comfort is most perceptible in a conference setting, when the phone renders voices in spatial way all around the room. All of the speakers seem to be seated at the same table: conversations are easier to follow, less exacting, more focused on the essentials. The ability to distinguish sounds, to filter out background noise and concentrate what people are saying, even in motion, also helps to optimise listening comfort. The desktop phone's operation is based on the iPhone (or iPad / iPod touch). Through its user- friendly, smart and intuitive invoxia application, the user moves in a familiar environment. Its unified interface brings together all contacts (mobile and office) and all incoming calls are received on the same device (iPhone or invoxia desktop phone). Landline/mobile convergence increases the productivity and ease of use of business communication tools. The invoxia application - available free from Apple's App Store - is designed to maximize user experience. It will reflect a constantly-changing selection of Voice over IP providers. When creating their invoxia settings, users will simply tap on their operator's tab to obtain an automatic connection, as simply as with the email setup on Apple devices. Invoxia is compatible with any operator using SIP technology. The connected device can perform all software updates remotely. It's an ever-changing appliance, not made obsolete by technology, but constantly improved and enriched with new services and applications. It is also a durable device that will change with the user as it follows the iPhone's own evolutions. Particular attention was given to energy usage throughout the design process. For instance, ARM processors were selected for their notoriously low power consumption. The use of noble materials such as stainless steel and glass encourages recycling. In standby mode with an Ethernet connection, the phone consumes nothing at all. Product packaging also makes extensive use of recycled materials. • Incoming GSM call answer in hands-free mode or on the wired handset.